Systematic diagnosis of atlantooccipital dislocation (AOD) has been described by Powers et al. based on X-rays. Reports of adult AOD have been commonly described in front-end motor vehicle collisions with unbelted occupants and airbag interactions. , To the knowledge of the authors, only one trauma patient has been reported in the literature who survived AOD during a side impact collision. Reported AODs in the literature suggest that the presence of associated injuries should lead to a high index of suspicion. Cranial nerve deficits are common among such injuries. ,, We present a rare case of a side impact collision resulting in AOD with related cranial nerve deficits. The patient was a 51-year-old female, and was of 165 cm in stature and 101 kg in total body mass. She was the driver of a four-door sedan stopped at a controlled intersection facing north. As the patient began a left turn into the west bound lane, an east bound half-ton pickup truck entered the intersection and collided with the driver side door of the case patient's vehicle. The patient was restrained in a three-point seatbelt and the front driver-side airbag did not deploy. Upon extrication, the patient had a Glasgow Coma Scale (GCS) score of 15, and she was immobilized in a hard cervical collar and transported to a local hospital. From there, she was airlifted to our Adult Level One Trauma Center, with a stabilized GCS score of 15. Twenty-four hours after admission, the patient developed mild dysarthria and bradypnea. After decline in respiratory status, the patient was intubated and immobilized in a halo brace. Diagnostic radiograph, magnetic resonance imaging (MRI), and three-dimensional computed tomography (3D CT) images were obtained. The patient also developed a left cranial nerve VI palsy and quadriparesis at this time. Plain X-ray radiographs indicated an anterior AOD with a Powers Ratio 1.1 [Figure 1]  . The AOD was confirmed with CT scans [Figure 2], and imaging of the brain revealed a subarachnoid hemorrhage in the posterior fossa. Intraventricular blood was noted in the fourth ventricle and prepontine cisterns. 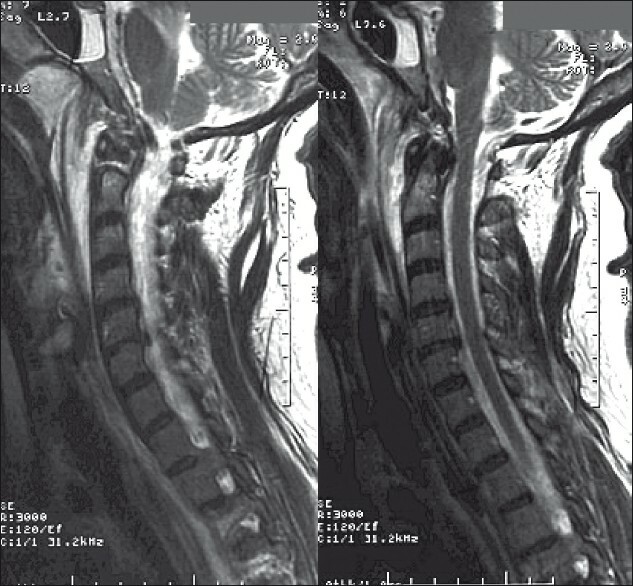 MRI revealed a cervical cord contusion from the occiput to C2, and an epidural hematoma in the tectorial membrane and alar ligaments at the C1-C2 level [Figure 3]. Angiography findings indicated intimal tears of both cervical vertebral arteries and rupture of the left external carotid artery. The patient was taken to the operating room, general anesthesia was administered, and fiber-optic intubation was performed. The patient was turned to the prone position with the halo vest in place. 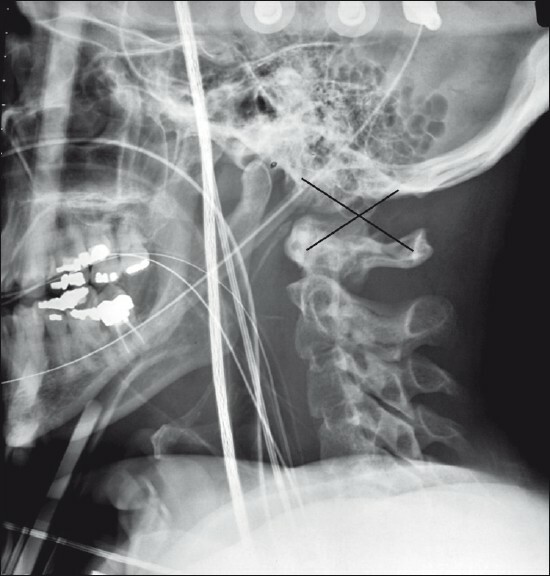 The posterior portion of the vest was removed and occipitocervical alignment was verified by intraoperative fluoroscopy. The occiput and upper cervical spine were exposed through a standard midline exposure. The Atlas More Details was completely dislocated from the occiput, and disruption of all atlantooccipital ligaments and capsule was seen. Rupture of the alar ligaments, tectorial membrane, and inferior portion of the vertical cruciate ligament was also noted at C1-C2 level. The epidural hematoma was evacuated bilaterally from around the spinal cord at the occiput-C2 level. C2-C3 joints were intact. An occiput-C2 fusion [Figure 4] was performed using the Summit (Acromed/Johnson and Johnson, Raynham, MA, USA) system. This included placement of three screws into the occiput, sublaminar wires beneath the arches of the atlas and across the lamina of C2 bilaterally. The patient was positioned in a halo vest and monitored in the intensive care unit. Her quadriparesis partially resolved into a residual mild right-side hemiparesis. The sixth-nerve palsy on the left side did not improve. Significant diplopia was noted initially; however, this gradually resolved over the treatment course. At the time of discharge, the patient was neurologically intact on the left side of her body. The residual right-side hemiparesis persisted, as well as the left sixth-nerve palsy and minor dysarthria. While survival after AOD in a side impact collision has been reported, there is a lack of mechanistic understanding of the mechanism of injury. , The present study adds to the body of literature and emphasizes the occurrence of AOD caused by vehicle-size mismatch. Investigation of the collision determined that the interior of the sedan door and parts of the truck grille struck the left side of the occupant during impact. The left shoulder and rib cage of the patient were forced transversely toward the midline and downward. During the time of vehicle-to-vehicle contact, the truck hood and upper regions of the grille were above the driver side window sill. Using an exemplar occupant and vehicle, it was verified that the impacting truck's hood front edge was at the level of the patient's craniocervical junction. 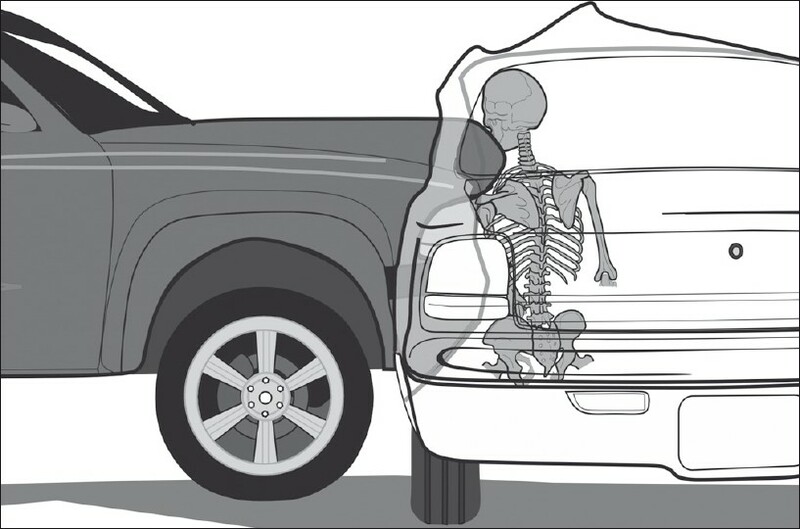 Further analysis based on her anthropometry indicated that the level of her skull base and mandible was maintained against the truck hood as the left shoulder and rib cage were fractured and continuously forced transversely and downward. The impact produced a distractive force along the length of the spine and induced tensile forces to the ligaments of the upper cervical spine, resulting in AOD [Figure 5]. Several reports describe various injuries in combination with AOD. Few specific symptoms have been observed. ,,, Diagnosis is usually based on associated injuries and a high degree of clinical suspicion. ,, A cervical spine distraction mechanism resulting in AOD is often associated with facial abrasions and lacerations, mandible fractures, arrhythmia, apnea, asymmetric cranial nerve palsies, loss of consciousness, subarachnoid hemorrhages, and thoracic or abdominal injuries. 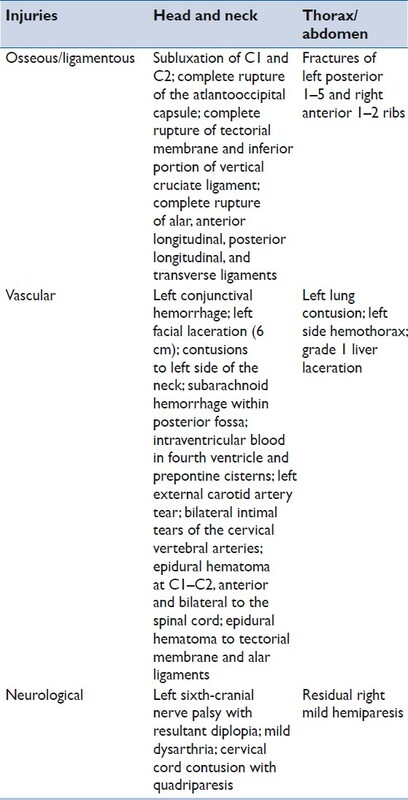 ,,,,,,, Our patient sustained a number of these associated injuries [Table 1]. Limited trauma below the abdomen included a grade 1 liver laceration caused by the seatbelt. Further, evidence of trauma was noted at the upper left side of her thorax, cervical spine, and cranial regions. The initial radiographs showing fractures of the left first five ribs, with hemothorax and concomitant left lung contusion were strong indications that the maximum load of impact was at the upper thoracic region. Embedded glass was found in the left facial laceration. A left conjunctival hemorrhage was noted in addition to substantial swelling and bruising on the left side of the patient's face, neck, and shoulder. Angiographic findings of the left external carotid artery tears indicated a substantial amount of force, applied to the cervical spine, during impact. As indicated by MRI, complete rupture of the inferior vertical cruciate ligament, alar ligaments, tectorial membrane, and the entire atlantooccipital ligament complex further localized the maximum load of impact to the high cervical spine. A considerable amount of force is required to rupture the vertical cruciate ligament and the tectorial membrane which suggested a subluxation at the C1-C2 level. This was a strong indication that majority of the force was directed to the upper cervical spine. Biomechanical studies of cervical spine ligament tensile strength have revealed that the ligaments of the OC-C1 junction require a high force for complete rupture. , Thus, the resultant AOD and rupture of the ligament complex in this patient substantiated the proposed distraction mechanism. Upon comparison, cervical spine radiographs did not reveal any apparent differences from other AODs caused by frontal impact. Thus, it can be concluded that the maximum load of impact was focused at the atlantooccipital junction of our patient. Asymmetric motor deficits are often caused by direct spinal cord injury or compression of the brainstem through damage to the surrounding bony or vascular structures. Delayed onset, with rapid progression, of neurologic deficit indicates that symptoms are due to compression and not direct injury. Based on the time of onset of specific neurological deficits in our patient, diagnostic angiography was used to investigate the surrounding vasculature. Intimal tears of both vertebral arteries (consequent to dissection) provided one plausible explanation for the dysarthria, bradypnea, and quadriparesis that occurred in a delayed fashion. ,,, Compression of cranial nerve X in the same region was associated with the bradypnea. ,, The cranial nerve VI palsy was not immediately explained by the angiographic findings. Damage to vertebral and carotid arteries, and vascular structures within the ligament complexes probably resulted in the subarachnoid hemorrhage in the posterior fossa, and the intraventricular blood in the fourth ventricle and prepontine cisterns. , It is likely that blood in these regions created pressure on the nucleus of the sixth-cranial nerve, and the nuclei of the hypoglossal and vagus nerves. , The resultant abducens nerve palsy and dysarthria may be explained by these observations. We suggest immediate careful radiological evaluation of the atlantooccipital junction whenever lower cranial nerve deficits are observed in the context of a side impact collision. 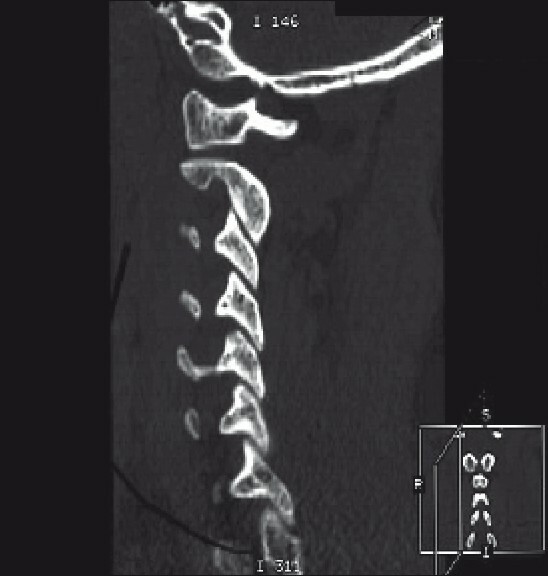 We also suggest that even when patients are neurologically intact at the scene, a side impact collision of this nature probably merits a careful consideration to cervical stabilization and urgent radiological evaluation for potential AOD. The suggested mechanism of injury should assist in the biomechanical understanding of these injuries. Examination of the distribution pattern of associated injuries as noted in this case is an additional reliable way to indicate AOD in trauma patients. This study was supported in part by the United States Department of Transportation National Highway Traffic Safety Administration DTHN22-10-H-00292, and DTNH22-05-H-41001, and the Department of Veterans Affairs Medical Research. The assistance of Mr. Dale Halloway is gratefully acknowledged. The material presented in this manuscript represents the position of the authors and not necessarily that of the NHTSA. 1. Powers B, Miller MD, Kramer RS, Martinez S, Gehweiler JA Jr. Traumatic anterior atlanto-occipital dislocation. Neurosurgery 1979;4:12-7. 2. Mokri B, Silbert PL, Schievink WI, Piepgras DG. Cranial nerve palsy in spontaneous dissection of the extracranial internal carotid artery. Neurology 1996;46:356-9. 3. Yoganandan N, Haffner M, Maiman DJ. Epidemiology and injury biomechanics of motor vehicle related trauma to the human spine. SAE Trans 1990;98:1790- 807. 4. Seibert PS, Stridh-Igo P, Whitmore TA, Dufty BM, Zimmerman CG. Cranio-cervical stabilization of traumatic atlanto-occipital dislocation with minimal resultant neurological deficit. Acta Neurochir (Wien) 2005;147:435-42. 5. Payer M, Sottas CC. 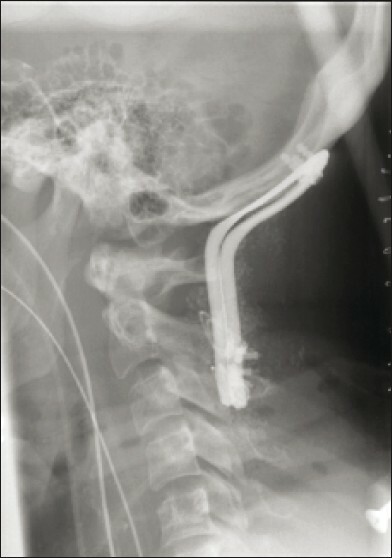 Traumatic atlanto-occipital dislocation: presentation of a new posterior occipitoatlantoaxial fixation technique in an adult survivor: technical case report. Neurosurgery 2005;56:203. 6. Ahuja A, Glasauer FE, Alker GJ Jr, Klein DM. Radiology in survivors of traumatic atlanto-occipital dislocation. Surg Neurol 1994;41:112-8. 7. Bellabarba C, Mirza SK, West GA, Mann FA, Dailey AT, Newell DW, et al. Diagnosis and treatment of craniocervical dislocation in a series of 17 consecutive survivors during an 8-year period. J Neurosurg Spine 2006;4:429-40. 8. Yoganandan N, Pintar FA, Maiman DJ, Cusick JF, Sances A Jr, Walsh PR. Human head-neck biomechanics under axial tension. Med Eng Phys 1996;18:289-94. 9. Adams VI. Neck injuries: II. Atlantoaxial dislocation--a pathologic study of 14 traffic fatalities. J Forensic Sci 1992;37:565-73. 10. Anderson AJ, Towns GM, Chiverton N. Traumatic occipitocervical disruption: a new technique for stabilisation. Case report and literature review. J Bone Joint Surg Br 2006;88:1464-8. 11. Horn EM, Feiz-Erfan I, Lekovic GP, Dickman CA, Sonntag VK, Theodore N. Survivors of occipitoatlantal dislocation injuries: imaging and clinical correlates. J Neurosurg Spine 2007;6:113-20. 12. Przybylski GJ, Clyde BL, Fitz CR. Craniocervical junction subarachnoid hemorrhage associated with atlanto-occipital dislocation. Spine (Phila Pa 1976) 1996;21:1761-8. 13. Myklebust JB, Pintar F, Yoganandan N, Cusick JF, Maiman D, Myers TJ, et al. Tensile strength of spinal ligaments. Spine (Phila Pa 1976) 1988;13:526-31. 14. Yoganandan N, Pintar FA, Larson SJ. Frontiers in Head and Neck Trauma: Clinical and Biomechanical. The Netherlands: IOS Press; 1998. p. 743. 15. Ahn JY, Chung YS, Chung SS, Yoon PH. Traumatic dissection of the internal maxillary artery associated with isolated glossopharyngeal nerve palsy: case report. Neurosurgery 2004;55:710. 16. Kim T, Chung S, Lanzino G. Carotid artery-hypoglossal nerve relationships in the neck: an anatomical work. Neurol Res 2009;31:895-9. 17. Machnowska M, Moien-Afshari F, Voll C, Wiebe S. Partial anterior cervical cord infarction following vertebral artery dissection. Can J Neurol Sci 2008;35:674-7. 18. Maiman DJ, Yoganandan N. Biomechanics of cervical spine trauma. Clin Neurosurg 1991;37:543-70. 19. Garton HJ, Gebarski SS, Ahmad O, Trobe JD. Clival epidural hematoma in traumatic sixth cranial nerve palsies combined with cervical injuries. J Neuroophthalmol 2010;30:18-25. 20. Kato MY, Tanaka I. Toyoda. Delayed lower cranial nerve palsy (Collet-Sicard syndrome) after head injury. Injury 2006;37:104-8. Luck, J.F. and Nightingale, R.W. and Song, Y. and Kait, J.R. and Loyd, A.M. and Myers, B.S. and Dale Bass, C.R.